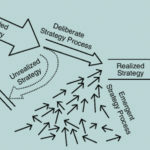 Develop strategy in light of their organization or department's needs. Balance planning and foresight with flexibility and openness. Recognize the important role that middle managers can play in the strategy process.